Last week we celebrated the Summer Solstice with the release of the Druid costume available for free, which we’re pleased to see many of you enjoyed. 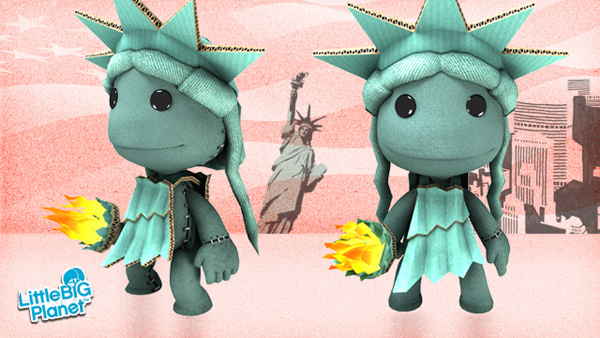 To continue the celebrations, we’re marking this years Independence Day by releasing a Sacktue of Liberty costume, available once more for free! Featuring the iconic crown and robe from the Statue of Liberty, the costume also includes the famous torch of enlightenment, complete with glowing flames of fabric. The Statue of Liberty (officially titled Liberty Enlightening the World) was a gift from France to the United States of America in 1886 to commemorate the centennial of the signing of the United States Declaration of Independence. Sculpted by Frédéric Auguste Bartholdi, the 93m (305ft) high statue’s internal structure was interestingly enough engineered by Maurice Koechlin – none other than the designer of the Eiffel Tower. It is now internationally recognised as a symbol of the United States of America, and a fitting choice to celebrate the United States of America’s day of Independence this July 4th. Head over to the PSN Store this July 2nd to grab this limited-time costume in time for the big day. And don’t forget that the Druid costume is still available this week, but for a limited time only, so make sure you download your Druid before Thursday; if only to secure yourself that awesome beard for your Sackboy.